Louise Glück wrote the foreward for Richard Siken’s Crush, winner of the Yale Younger Poets Series Award for 2004, declaring: “This is a book about panic.” I would disagree. This book is about a species of desire that drives you to panic. Panic is the result, but the book is about a desire that is red, as in a slice of apple, a kiss, and blood. It is the desire of recurrent nightmares of illness, hunger, and bodies pulled from a river. The book also quietly lets the reader in on another secret: the strange pain of sustaining the sensitivity required of the poetic act. In one poem, Siken asks his reader to “Imagine standing in a constant cone/ of light. Imagine surrender. Imagine being useless.” In another, the light that is required of the poet is threatening, that when we are possessed by light there is the possibility that we will become accustomed to the light and not recognize it for what it is. Stunning. And enormous. The effect is rather like falling down a waterfall and safely landing in the pool below. The lines and line breaks matched my reading of them; this is no appeal to organicism, believe me. There is a finality in the form that makes it impossible to imagine the poem working in any other way than the way it appears on the page. It is the tao of the line. As the opening poem title suggests, Siken is also concerned with narrative possibilities. Two poems stand out as the most accomplished in this matter: “The Torn-Up Road” and “Boot Theory.” The first line of “The Torn-Up Road”: “There is no way to make this story interesting.” The screenwriters of the movie Memento probably had the same thought, and with the same solution: a series of retelling starting from the resolution of the story and moving backwards through time revealing more and more of the backstory. The effect is reeling because the violence of the story is repeated in every stanza. In “Boot Theory,” each stanza begins with a similar opening, a take on the old jokes that begin A man walks into a bar and says…In “Boot Theory,” Siken spins out the possibilities of what happens next in each subsequent stanza. It is an emptying out of narrative possibilities until only one resolution is possible, which is revealed in the last stanza. Adam and Eve as tuna fish sandwiches. Given the historical metaphors that have suggested the god-like vocation of the poet, Siken is perhaps suggesting the anxiety that comes along with writing. It was Ibsen who said that to write is “to sit in judgment of yourself,” and these poems agree. History repeats itself. Somebody says this. over the sock drawer with its socks, its hidden letters. trying to define a room he is outside of. After meeting Emerson, Whitman said, “I was simmering, simmering, simmering, and Emerson brought me to a boil.” Then, he wrote the first edition of Leaves of Grass. 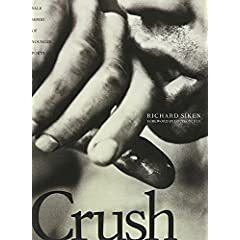 My point, if you haven’t gotten it already: the pressure to publish early and en masse will result in a national poetry of mediocrity, one that Richard Siken refused to settle for when he wrote Crush. He waited for his pot to boil over until all his days “were bright red, and every time we kissed there was another apple/to slice into pieces” (3).